Linda has worked for MCRCD since 2005, first serving as the part-time Navarro Education and Outreach Coordinator, and since 2011, full-time as the Navarro Watershed Coordinator. Linda specializes in California native plants and has designed and implemented numerous riparian re-vegetation projects. She is a graduate of the University of Arizona, and brings with her 25 years of experience in organic gardening and permaculture. Linda received training in USDA NRCS Conservation Planning and is currently enrolled in a three year Certified Educators program in Holistic Management. 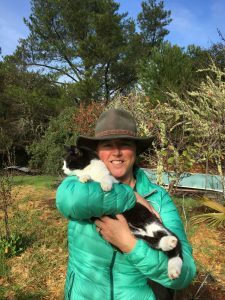 In line with her interest in assisting farmers and ranchers, she helped develop the Mendocino County Local Food Guide and is working with RCD partners to bring LandSmart™ conservation planning program to Mendocino County.